In our example, we have only two kinds of enemies in the level: BADDY_1 and SMALL_SCORPION. 2. When will the bar appear? The first 1 is just the ID of the GlobalTrigger. The GT_CONDITION_GROUP says that this GlobalTrigger works only with TriggerGroups. The 1, 2, 3 are TriggerGroup ID's, and say: 'if TriggerGroup#1 is true, then TriggerGroup#2 (I mean, the appearance of the bar) will happen. If the condition (TriggerGroup#1) is not true, then TriggerGroup#3 will happen'. This trigger says: 'if Lara's just aiming at somebody/something, then Local Long Beta=not 0, but some other (positive) number, or else it=0'. This trigger examines if Local Long Beta=0 or more. If it's 0, then there's nobody/nothing aimed at, so there's no need TriggerGroup#2 to happen. (It means that TriggerGroup#3 will happen.) But if it's not 0, then TriggerGroup#2 will happen, the bar will appear. Next step we have to use Current Value with the value of Local Long Beta. So this trigger copies the value of Local Long Beta into Current Value. This trigger converts the value of the Current Value. The solution is the index of the object Lara's just aiming at. (Not NGLE index, but the one that the game uses. These are not always the same.) 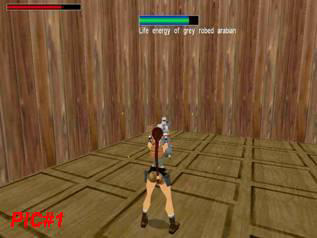 - Now the game knows which enemy's health will be shown in the bar. This trigger uses Savegame Memory to define the object with that game index (the value of the Current Value) as the subject of Selected Item Memory. This trigger uses Selected Item Memory to write the slot ID number (see NG Center\Reference\Slot Moveables) of the object with that game index into Local Short Alfa1 variable. This trigger uses Savegame Memory to define that slot ID number (the value of Local Short Alfa1) as the subject of Selected Slot Memory. This trigger uses Selected Slot Memory to give a new value to the Local Short Alfa1: the value of the maximal health points (MHP) of the slot with that ID number. If we have an enemy with 200 MHP, and it's just appeared, and it's still totally healthy, it won't look to be injured until it's half-healthy. Because of there won't be any black area, until it's healthier than 100 HP. The solution is: let's use proportion. Then why do we care about 'proportion' at all? After all, if 100/75=1, then the 75 MHP will never be at unit 100 in the bar, this 75 will always be shown at unit 75. The further part of the description will reply to this question. This trigger uses the position#0 of PARAM_BIG_NUMBERS. The value we'll find there is 10000. This trigger sets this value in Current Value, giving a new value to it. This trigger divides value 10000 (the value of Current Value) by the MHP of the actual slot (the value of Local Short Alfa1), giving a new value to the Current Value. This is the point where we calculate the hundredfold of any proportion, for example, that 100/75=1,33 proportion: 10000/75=133. The object with that game index is still the subject of the Selected Item Memory. This trigger uses the Selected Item Memory to copy the actual HP of that object into the Local Short Alfa1, giving a new value to this variable. This trigger multiplies the value of Current Value by the Value of Local Short Alfa1, giving a new value to the Current Value. For example, if the enemy with 75 MHP has 70 HP now, then the solution is 133�70=9310 now. This trigger divides Current Value by 100, giving a new value to this. The solution with that 70 HP: 9310/100=93,1, I mean 93. - And this 93 is the unit where the 70 HP will be seen in the bar. (So, we can see now, using the hundredfold of the proportion, we could prevent the problem of "the solution of the dividing operation is a whole number" thing. If the condition (TriggerGroup#1) is not true (i.e. Lara is not aiming at anybody/anything), then TriggerGroup#3 will be activated. a, It makes the bar disappear off the screen, if Lara has just shot the enemy dead, or if the enemy that Lara's just been aiming at has escaped, and there's nobody/nothing else to aim at now. b, There hasn't been any 'aiming and shooting event' lately, so there's no custom bar on the screen just now, so there isn't anything to disappear. This trigger uses the position#1 of PARAM_BIG_NUMBERS. The value we'll find there is 41 - this is one of the enemy slot ID's of our level. The slot ID of BADDY_1. The trigger examines the slot ID in Local Short Alfa1. (See: $2000, 256, $350 above.) If the variable equals with position#1, then this condition is true, because the enemy Lara's just aiming at is a BADDY_1. ; <#> : Variables. Text. Copy the <&>NG String to (E)Text Variable. Because the enemy Lara's just aiming at is a BADDY_1, this trigger gives #0020 (Text1) variable the value of ExtraNG String#14: 'grey robed Arabian'. So the actual name of the bar will be 'Life energy of grey robed Arabian' now. This trigger uses the position#2 of PARAM_BIG_NUMBERS. The value we'll find there is 106 - this is one of the enemy slot ID's of our level. The slot ID of SMALL_SCORPION. The trigger examines the slot ID in Local Short Alfa1. 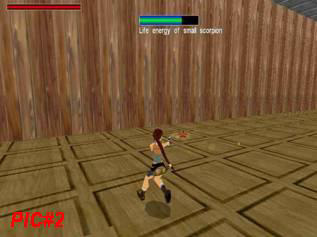 If the variable equals with position#2, then this condition is true, because the enemy Lara's just aiming at is a SMALL_SCORPION. Because the enemy Lara's just aiming at is a SMALL_SCORPION, this trigger gives #0020 (Text1) variable the value of ExtraNG String#15: 'small scorpion'. So the actual name of the bar will be 'Life energy of small scorpion' now. 1. Write the enemy name you want to see in the name of the bar into a (any) string of ExtraNG - for example string#16. 2. Write this enemy's slot ID number into a position of PARAM_BIG_NUMBERS - for example position#3. 3. After the last trigger of the TriggerGroup#4, write a CONDITION (PARAMETER) trigger: "Variables. The <#>Numeric Variable is = than (E)Big Number value". #=Local Short Alfa1, E=PARAM_BIG_NUMBERS position#3. Don't forget using "TGROUP_ELSE" constant after the number $8000 of the trigger. 4. After the CONDITION you've just written, write a FLIPEFFECT TRIGGER: "Variables. Text. Copy the <&>NG String to (E)Text Variable". &=16, E=Text1. 1. Write this enemy's slot ID number into a position of PARAM_BIG_NUMBERS - for example position#4. 2. Between $2000, 256, $350 and $2000, 118, $4 triggers of TriggerGroup#2, write a CONDITION trigger: "Variables. The <#>Numeric Variable is = than (E)Big Number value". #=Local Short Alfa1, E=PARAM_BIG_NUMBERS position#4. Don't forget using "TGROUP_NOT" constant after the number $8000 of the trigger.